Post subject: Admin Abuse? Unbindall Abuse? IUNNO! SHARKfldzx: looking up / to the side? Dumped console text to D:\Games\ProQuake/id1/condump.txt. Press FIRE or JUMP to disable 'afk' status. PainKiller is an admin @ Shmack? Can you check logs and the such for abuses mentioned? I'm currently tounge in cheek mode, as I don't have the fully story. I checked the logs for June, July, and August and no admin issued that command. Also, when an admin issues a command it's broadcast to the server so everyone knows who did what to whom. I'll explain this to that person when I see them again. Thanks again! "Hoppy" is one of those annoying name changers (gone by my name, Moss, etc.. etc...). Calls people cheats. I wouldn't take his grievances seriously. But cool of you to look into it. being a name changer and the flat out accusation that was made are two entirely different things, thats why I looked into it as best I could. There are still discussions going on about this subject, Im sure teaching that person how to use the screenshot,or condump function will come in handy for everyone in involved next time. So,when a lack of screenshot or a lack of evidence to support such a claim isn't given a 2nd thought. I was there that day, it was in "end". What this clown doesn't tell you is that he and Lahey had disabled hook, shield, powerups, just about everything. He says runes were on, but I remember them being off. help-settings reveals all. It was before slot changed the voting math and 4 votes to reset couldn't cancel 2 no votes, so basically these two jokers had ruined the game for everyone. PK did us a favor. I can't speak for unbind, but these two were kicked, the config got reset, and the game could be enjoyed again, since these two abusive jackals had ruined it. This sack of crap deserves a ban, not an investigation. This sack of crap deserves a ban, not an investigation. A claim was made that there was admin abuse, so I looked into it. It seems as though PK did a bang-up job though so kudos to him. I had 16 runes earlier today and PainKiller was obs. He tossed all of my runes. Oh and then he banned me. Just FYI he does issue commands into console and that makes me uncomfortable. Painkiller is an admin. If he asks you to stop doing something you should listen. If you feel his request is out of line, provide more details here. Just to shed some additional light on this issue as a few things were omitted. Cobalt, EZJack, QuakeNekid, Fuzzy and Die_PLZ can attest to the accuracy or lack thereof. "Timothy" was asked to sit a game out as he had been dominating the server for some time when I got there last night. Players were leaving and were about to leave due to his conduct. Trash talk is part of the game and he is in the mute file, so it had nothing to do with that. For those who don't know, type 'ignore-mute-client' in your console and he'll disappear. Anyhow, I asked him to sit a game out in order to give others a chance which he refused to do. He snagged the Pack Rat rune and was running up the score even faster to 50 with games lasting maybe 5 minutes. Ten at best. I then removed his rune. I gave him another warning that he'd be kicked if he didn't listen. This was the third warning I had given him. He thought that was amusing and decided to test the ban theory. Before being banned, Timothy was kicked twice but kept logging back on. So, the ban was then put in place. The ban was originally a temporary one so that he couldn't get back on for the rest of the evening. And the rest is captured in his screenshot above. My main hope as an admin of a Quake server (and this goes back to 1999 when I first started running one) is to provide a game in which the majority of players have a fun time. If and when someone can't play nicely in the sandbox, then it's time for them to leave, one way or another. If "Timothy" can assure me that his online behaviour will improve, then he's welcome to come back. And Timothy, Omicron, whatever... Quake is dying. It's in it's final days. Please don't make it difficult for those of us to enjoy the game we love. Soon enough, this will be all a memory. You wouldn't stand for it Omicron and neither will we. As per the screenshot, there was nothing being done on my part other than playing Quake. He tossed my runes even before that, stealthily from observer. He shouldn't be able to execute commands on my client. That is unacceptable. I have more of an issue with that than I do him banning me for being too good. Anyways, someone asked me to ping up from a modest 35, I did ping +20. Then I got kicked and banned. You support this? I ask that you respect my admin. If you have an issue with his actions PM me or make a post on the forum such as you have done. He asked you to do something and you ignored him so that is why he banned you. He cannot execute commands from your client, he can only activate admin commands via the admin menu. One of those commands is removing a players rune and another is unbinding all of your keys. These admin actions are there to get your attention. Often people who are kicked and banned don't even know why, but these actions are there so you take it seriously. While I personally may not have banned you for the reasons outlined, I respect PK's decision and I support him. He isn't looking to cause you harm, his intention is to keep order to the server and make everyone happy. Unfortunately, that goal is an impossibility and in your case, you got the short end of the stick. His story is that he banned me for the benefit of other players. Putting aside the notion that banning someone for being too good is shortsighted, the screenshot shows 2/6 of the players in the game vocally asking him not to ban me. Pretty cut and dry that he's in the wrong. Not that it matters. This is Quake in 2015. I understand what you're saying and I agree. 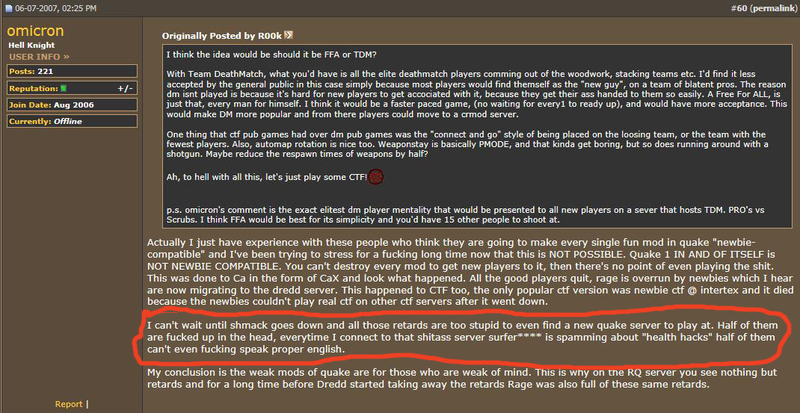 I think the fact that it is Quake in 2015 that has people on edge. Nobody wants to see Quake die and sometimes decisions are made with the best intention to preserve a dying community. Acting aggressively towards other players is often seen as destructive towards the community, so it isn't completely a shock that some would be on the defensive. Let's try and move forward keeping in mind the server is here for everyone to enjoy. No one wants to see quake die. We are all operating from that premise; but suppose an individual wants to see a particular server die? I have concerns with this incident because Omicron's actions in-game elicited a warning from an admin; this warning went unheeded and administrative action was taken. The issue was disregarding an admin. The underlying motivation for the actions of the player may also deserve scrutiny. Omi, you are a great player, but you have always hated rune quake and rune quake players. Why are you even here? Please feel free to share your concerns. How do you propose I discover the underlying motivation of someones actions? Until I can figure that out, I'm going to have to rely on scrutinizing a players actions. I'm not upset with someone cursing out the mod. Why are you? and with their all powerful ping proceeds to take over the server to try and get it to clear out, and alot of the time they are succeding. I made some points on the other thread that you ignored. Basically I gave some scenarios that would produce the same results as what you're claiming is happening, but involving more people and without the conspiracy. I think some of us are concerned that it will have a negative impact overall...to me the end result will be LESS players on the server. So to avoid losing players we should remove players? Have you worked so hard over the years keeping this mod and the server going only to come to an empty server? Sure I could be wrong and I hope not, but the average new person who hears about RQ from another player who promotes it in a GOOD way...and I stress GOOD - versus the kind of players the kind of posts made by a person like Timmy can attract, I would tend to think would be a prefered development over one thats now trending. Suppose there are a group of players who can't stand players who aren't as good as them or can't stand players who are easily offended. Don't they have just as much of an argument as you? They could claim that more players would play here if only we got rid of those whining no skilled players constantly accusing them of botting or winning merely cause of ping. Is this any different than someone going to school and was left back so many times, that they now need to bully and beat up on younger kids who are smaller and less powerful than the older kids in that class? What would a good teacher or principle do if they saw this going on? They would remove this kind of person because it would prevent other kids in the class from learning or being motivated towards learning in a positive environment. Quake is a game about killing people. You're not going to get along with every single player you come across. Some players are going to dominate you and call you names and do anything they can to get under your skin. What do we expect you to do ? All we can do is let you know what we think...and I can speak only for myself, but I think the people supporting the complaints agianst Timmy are speaking out because we do not want the server to down the toilet. I understand the point you're trying to make. I don't fault anyone for feeling the way you do. I can even remember a time when there were a couple servers like this. These servers were home to a select group of regular players who were friendly with each other and purged anyone who didn't fit in. There is nothing wrong with having a server like that, but Shmack has never been that type of server and I don't have any plans of changing it. I welcome all players, even the ones who hate my mod and think it's for noobs. Thanks, I appreciate your honest feedback.